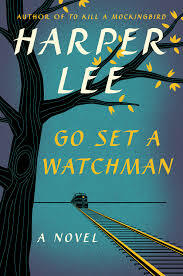 I was hoping that I wouldn’t have to write this, but it appears that I have no choice but to set things right about Go Set a Watchman, the newly-published work by Harper Lee. The screams and cries are becoming louder as the book rockets to the number one place on the bestseller list and shows no signs of falling. People, people, people… Atticus Finch as you know him from Mockingbird, and supposedly depicted in Watchman has not changed. He didn’t become a racist. He didn’t forsake you. He’s a different person altogether. Authors know what I’m talking about but for the rest of you, let me explain. Lee wrote Watchman first. She turned it in to her editor who told her to rewrite it from a different point of view. This is not an uncommon, request, especially for a first time author. When I wrote my first book, On the Line, I turned in my first one-third of the manuscript so my editor could see how I wrote, whether we were on the same page (heh) and whether my approach was what they wanted when they paid me my advance. He came back with excellent advice. Change my point of view from several people, to just one person who, after all, was the true focal point of the story. I rewrote it in that manner, and the book was published and did extremely well, hitting the business bestseller list, going to paperback, audio, the whole deal. What did I do with the original draft? I threw it away. It wasn’t the book that the publisher wanted and it was tossed. It deserved to be tossed. Lee wrote a draft. The publisher didn’t like it, she put it aside, and she wrote To Kill a Mockingbird which did even better than my book. Clearly, with the editor’s guidance, and I’m sure some additional thinking on her part, Lee decided that Atticus Finch was indeed to be the virtuous man that he ended up being. That’s the Atticus Finch that we all love, admire and feel connected to because he was courageous for his time. The Atticus in Watchman was a first try, a wrong draft to be relegated to the wastepaper basket once the real book was finished. Unfortunately, the manuscript survived and it’s making the publisher lots of money and many readers unhappy. Some folks are so distraught that I fear ritual suicides or the complete dismantling of their moral tenets. If you’ve ever seen DaVinci’s sketches of the Mona Lisa, they look nothing like what the masterpiece ended up as. Would anyone think those sketches were the real Mona Lisa? Of course not. They were drafts, first tries, a clearing of the mind on canvas, whatever you want to call it. Look at them. Study them, but don’t say they’re the Mona Lisa. The same applies to Watchman. It’s not a sequel, prequel or any other ‘quel.’ It’s a standalone book that, if Lee had not written it, might now be amongst the other discarded drafts that all writers produce before they turn in their best work, the work that reflects their final and true thinking. Okay, are we good on this? I am with you all the way on this one and you have all the evidence you need (in recent descriptions about how the manuscript came to light) to back it up. It is a first draft marketed and sold as a finished novel. It’s a shame. And yes, it’s something that anyone who has written a book, whether fiction or non-fiction, will recognize as a first draft that should never have been published — because the book wasn’t done. Only if you’ve wrestled with a book — chopped chapters, changed point of view, reordered events, added or dropped characters, etc. — can you know how different a first draft can be from the final ms.
Spot on. There was a lot of doubt swirling around whether Harper Lee, a well-known recluse, wanted it published, and my guess is that she did not. Who would ever want to show their first drafts to the world? Seriously. What artist in any medium wants people to see their misses, tests and failures?